President Obama was exalted by the black community after his commencement speech at Morehouse College, which is not unusual, since many in the black community heap praise on Obama for just showing up. But according to Washington Post reporter Courtland Malloy, the black president who bellowed about black male responsibility at commencement is the same president who is allowing his administration to cut student loans to black students. 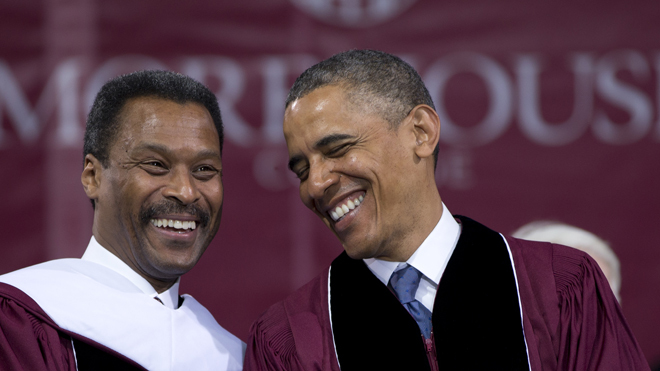 When President Obama spoke to Morehouse graduates, he implored them to be responsible to both themselves and their communities. But when does President Obama’s responsibility begin? When should we expect him to be responsible to both country and community? It’s the height of duplicity to speak at a black college commencement about responsibility, then head back to the White House and allow loans to black students to be cut under your watch. When Obama promised to be a transformational president, is this really what you had in mind? I’ve learned through experience that those who have been taking a lengthy time to complete their degrees are in for a surprise as well, because a ceiling has been placed upon Pell Grant elgibility (600% max) and limits have been placed upon the availability of loans(subsidized $23,000 for both dependent and independent students and a max of $31000 for dependent students for all Stafford loans and $53000 max for independent undergrad students for total subsidized and unsubsidized ) toward undergrad completion of 4 yr degrees. So disappointed in Obama it makes me sick. Black isn’t always the answer. We did better under a white President. seeChanB You’re right, He’s screwing everybody…. Some black folk really need to come to reality, and stop always blaming someone for what they can no longer get. I use to work for the U.S. Dept of Education in Administrative Garnishment, and you would be astonished by the number of people that refuse to pay back their student loans both black and white letting the interest calculate into astronomical numbers where it was almost impossible for them to pay back. I recently completed my B.S. in Psychology at a HBCU school and now pursuing my Masters at the Univesity of Southern California, all with student loans. What I found most disturbing while attending my undergrad the number of students that applied for student loans with no intention of completing college, only to receive the money to buy material items (new cars, jewelry, etc.). I started paying back my undergrad loans as soon as I graduated which a lot of people will not do. If people stop attempting to take advantage of the system and pay back what they borrowed, then it would not reflect and affect the students that really want to go to school behind them. So in my opinion it is not Obama’s fault, it is the fault of people trying to get over on the system. People should not be taking out all that debt right now…you are not going to be able to pay it back…i owe over 100,000 almost at my 138000 life time mark…i have only gotten a job with one of the degrees and that job will never be enough to pay the educational loans back….. I feel that native African Americans have been set back years because of President Obamas attitude toward us. I regret voting this year I think he is racist against that side of his family. He always does and have something negative about us after.we all supported him. To me he’s no better than Clarence Thomas. I expect nothing but put downs from him. He will never get another donation from me. He is against us. That is my opinion. When is the black Americans in this country wake up? Country first useless assholes…. kevinmscott because why should “useless assholes” care? Give us the back the sweat of generations of lives murdered and lynched so w-trash could live the American dream. When are white folks in this country going to wake up?